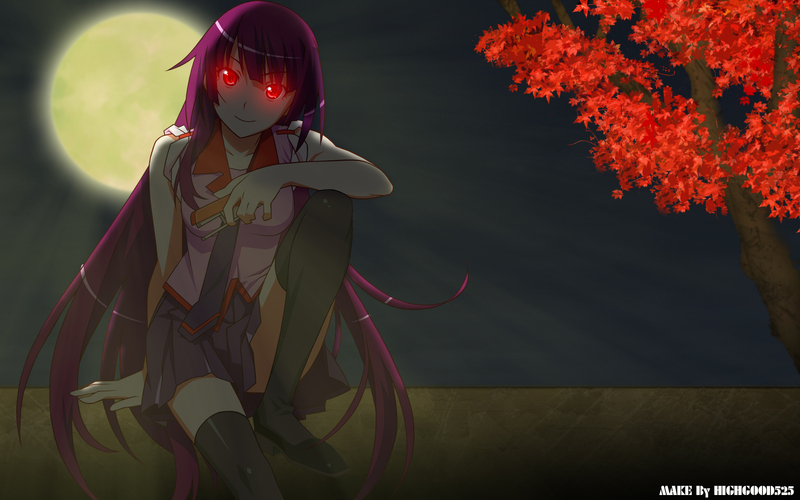 Hitagi orizin pic is wink and blue eyes, but i'm edit. mafle tree is make my self. the moon is not shining too all the sides and the leaves they look like they are on the screen and not on the tree and i guess it kinda weird that the moon shines so much at all and also maybe [ MAYBE ] it would look better if the rays of light would be behind Hitagi not in front, try playing with those rays :P its not to late to change. This could be better the wall shes sitting on well... its flat there is no real indication that shes sitting on the top of a wall... more like hovering on it. And your moon rays are a bit more, your drowned her in them.. instead of just suggesting them on the surroundings and her. Also the red eyes don't make much sense as she isnt a vampire... well maybe if you were suggesting shes scareh but still not a very good way of doing that. thanks your advise. it's help to me. And one more thing, the moonlight shines through her... It makes her look like she is a paper or sumthin. the concept for this wall is good however the leaves are too well lit for the rest of the dark wall. also just wanted to let you know that it is a Maple tree. As beautiful as ever,She looks frightening... imagine her in threaten mode, with a pen a inch from your left eye, but with red eyes. She might as well pluck it out.